(Bridgewater, N.J., Jan. 30, 2019) - The Somerset Patriots have announced the signing of right-handed pitcher Jake Joyce for the 2019 season. Joyce enters his first season with the Somerset Patriots and first in the Atlantic League. The 27 year-old has spent each of the last four seasons with the Schaumburg Boomers (Frontier League) as a go-to relief pitcher, including the last two seasons as the team’s primary closer. Joyce went 4-2 last year with a 2.58 ERA and 12 saves over 38 relief appearances. This came off the heels of an equally impressive 2017 season, when he carried a 2.68 ERA with 16 saves over 40 appearances. The Collinsville, Virginia native has been known for two specific stats in his time with the Boomers: relief appearances and strikeouts. 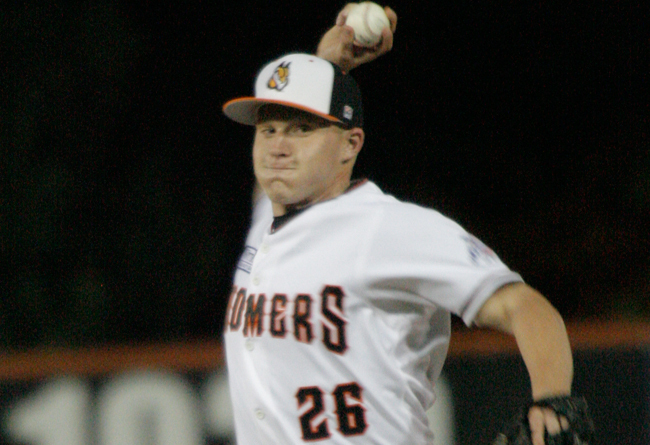 Joyce has ranked among the top two on his team in relief appearances in each of his four seasons with the Boomers, including a team-leading 34 and 40 appearances in 2015 and 2017, respectively. Additionally, The Virginia Tech alumnus posted a strikeout per nine innings (K/9) ratio of over 11.0 in each season with Schaumburg, finishing in the top four in the league three times (2016-’18). That includes three seasons over 12.0 and a career-best/league leading 14.5 K/9 in 2017, when he struck out 65 batters over 40.1 innings of work. Joyce owned a 16-11 record with a 2.41 ERA, 30 saves and 231 strikeouts over 160.2 innings pitching in his four seasons with Schaumburg. He led the team in appearances (145) and ranked second in strikeouts over this four-year stretch. The former 2013 ninth-round draft pick spent the first two seasons of his professional career in the Washington Nationals organization; both with Low-A Auburn. He owns 18 wins and a career 2.78 ERA with 262 strikeouts over six professional seasons.